Established 1980, Sportset set out to provide a service to volleyball players UK wide, prior to this time there had been little specific volleyball product in the UK marketplace, products included, apparel, footwear, uniform, printing, supports, nets, balls, etc from major brands such as Asics, Mizuno, Harrod, Rucanor, Tachikara & Mikasa together with its own Sportset bespoke branded uniform manufactured and printed in Bristol. Many of you will probably remember Sportset offering goods at tournaments in the early days together with the mail order catalogue. In 1990 the Company was purchased by ourselves along with its stock and customer base. As new owners we had set out to open up the product range and deliver an enhanced service to both the UK mainland and Islands including Northern Ireland and the Republic. To this end we introduced new ranges to the portfolio, watches, eyewear, and developed the well know Sportset Net System together with brands from the USA including Active Ankle, Tandem, Trace, Kaepa, Baden & Brine, additionally we also added eight new fabric colour options within our uniform manufacture together with printed pattern sleeves and enhanced Cad Cut digital printing systems. In 1997 Sportset relocated from Bristol to the South of England, Poole, this was a strategic plan to be closer to the up and coming Beach Volleyball circuit and in 2005 opened our brand new warehouse facility in Holes Bay Park allowing increased space for the future and planned company expansion. In an effort to further promote the company we visited many up and coming tournaments working together with the organisers to promote volleyball such as Sandwell, Gloucester, Cambridge, Ashcombe, Scottish Open, Weston, Hamworthy, Crown Services, Inter Services and many more. Later in 2000, after months of negotiation with Mikasa Japan we were appointed the sole UK distributor for the Japanese brand which was first used in the Tokyo Olympics in 1964 and is still the official mark for Volleyball, Beach Volleyball and Water Polo to this day. Since this new relationship we have increased the Mikasa branded goods from a handful to in excess of one hundred and fifty models distributed to retailers UK wide, many of these models are also sold through our retail outlet. We were also fortunate to be involved with LOCOG (London Organising Committee of the Olympic and Paralympic Games) and negotiated and supplied the Mikasa products printed to specification for the event. Sportset was then named as the official company to support the London games 2012. In addition at this time we opened our first online shop (Sportset.com) along with our mail order catalogue, this introduction allowed our customers more flexibility to order with a free delivery making the shopping experience much more user friendly and in 2007 we decided to end the posted printed catalogue for good. 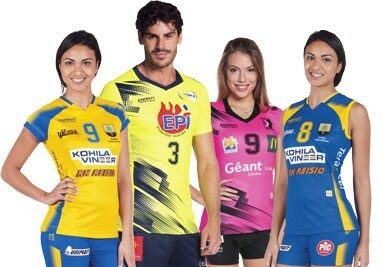 We also formed an exclusive relationship with Panzeri from Italy as our bespoke manufacturer of volleyball uniforms who then expanded to offer a comprehensive range of volleyball clothing and equipment. Alongside this and similarly we formed a contract with the Italian uniform arm of Mikasa for licensed volleyball specific clothing and equipment the majority of which is homologated with the FIVB (Federation Of International Volleyball) and carries their approval. Over the past ten years we have also worked more closely with Volleyball England, Scottish Volleyball, the NIVA, Welsh Volleyball and the Irish Volleyball Association, the aim to use our joint marketing ability to promote grass roots volleyball, to help with this we now have an extensive range of beginner balls and Volleyball England branded models. In the past three years we have contracted with Volleyball England promoting the Mikasa MVA200 and VLS300 as the official balls of VE competitions which now carry the VE approval stamp. When buying from SPORTSET you can feel confident in dealing with the premier Volleyball specialists. We supply equipment for all levels of play and for all age groups. Sportset at the forefront of manufacturing and retailing Volleyball equipment for almost four decades, we are committed to providing the product and service the customer wants, to this end we are dedicated to your total satisfaction. Many thanks for shopping with us over the years, we have come to know many of you personally from the indoor and outdoor events, we look forward to a continued professional and social relationship.